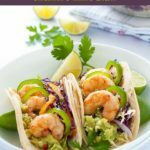 These Shrimp Tacos are loaded with zesty Tomatillo Guacamole, Cilantro Lime Slaw and garlicky buttered shrimp. Top them off with fresh jalapeño slices and a squeeze of lime. Say hello to our new favourite tacos! 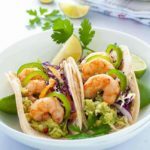 These shrimp tacos have everything we look for in a taco: crisp, crunchy shredded vegetables, chunky guacamole and a zesty dressing. While we often make fish tacos like these Halibut Tacos with Tequila Lime Marinade or these Grilled Fish Tacos with Pineapple Rhubarb Salsa , today I decided that shrimp was on the menu. I concocted this combination with garlicky buttered shrimp and a new favourite taco was born! 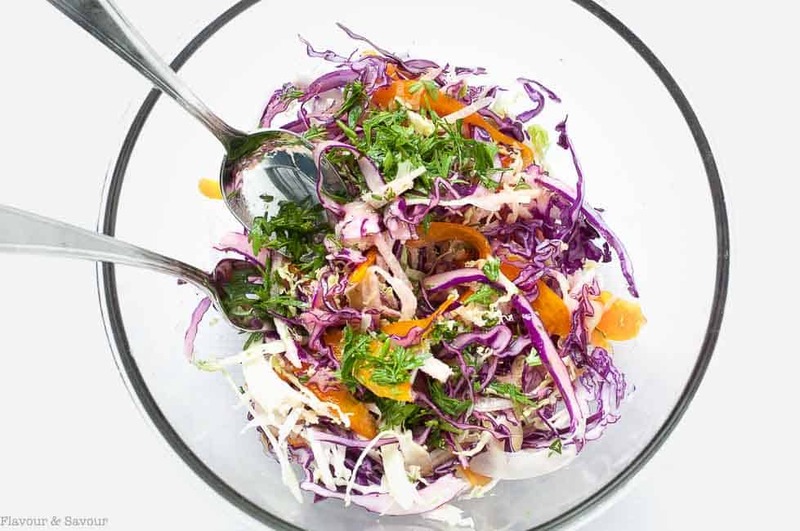 Make the slaw first, combining equal amounts of shredded purple and green cabbage, orange bell pepper and jicama. I used a mandolin to slice everything thinly, but a sharp knife will do the trick too. Or, use a box grater or the grating disc on a food processor to finely shred the veggies. Fresh! Toss all these crunchy vegetables with a piquant cilantro lime dressing. I added honey to the dressing to balance out the tartness of the lime juice. 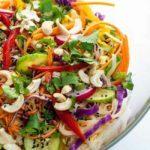 This cilantro lime slaw is slightly sweet and makes a great contrast to the garlic buttered shrimp. Just look at those colours! Next, make a batch of tomatillo guacamole. Mash a couple of avocados with a fork, leaving them a little chunky and add garlic, lime, cilantro and a little salt. Then, finely chop a couple of tomatillos to add a pop of flavour and some crunch to the guacamole. 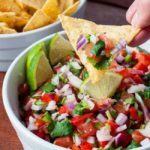 I usually add a few tomatoes to my tried-and-true Quick Chunky Guacamole recipe, but adding tomatillos instead is nothing short of brilliant, if I do say so myself! Tomatillos are readily available now. They are usually sold with their papery outer husk intact. Keep the husk on until you’re ready use them, then peel it off and wash the tomatillo as there may be some sticky residue left from the husk. 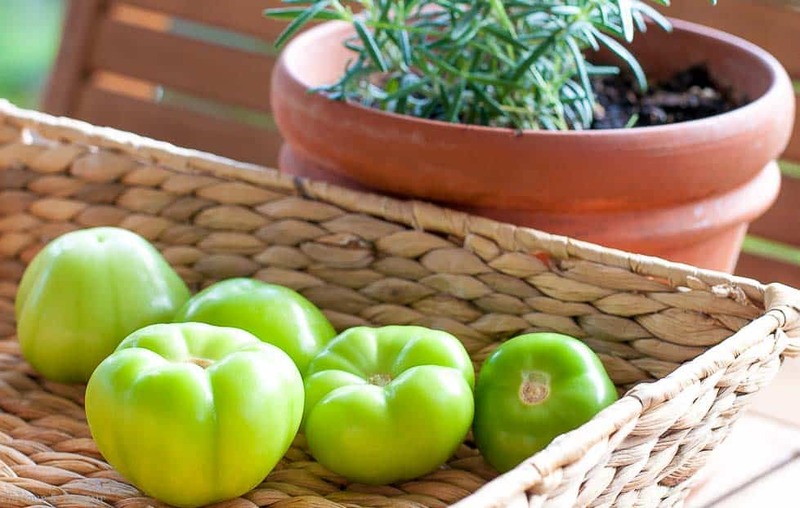 Choose tomatillos that have smooth, unblemished, bright green skin and are not much larger than a golf ball. Larger ones may have less flavour. And now that you have both the slaw and the guacamole ready, it’s time to grill the shrimp. The best way I’ve found to grill shrimp and avoid losing them between the grates is to skewer them first. Brush with garlic butter and grill for a minute or two on each side until they develop a nice colour and become opaque. Don’t overcook them. They’ll become rubbery, and no one likes rubbery shrimp! In a hurry? Sauté them in a skillet instead. To assemble the shrimp tacos . . . Begin by heating the tortillas. Layering two tortillas together makes them easier to handle and avoids leaks! Heat them either in the oven wrapped in foil, in the microwave covered with a towel, or if you like them crispy, heat a few at a time in a hot wok. Because of the increased surface area, a wok will heat 5 or 6 at a time, while a skillet will only heat 2 or 3. I used small, 5-inch white corn tortillas to keep this meal gluten-free. Then add your fillings! 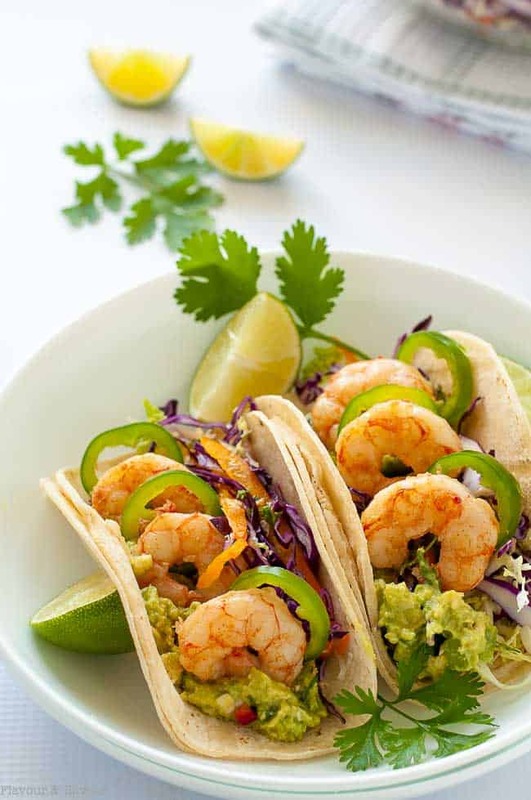 Start with the cilantro lime slaw, add the tomatillo guacamole, arrange the garlic buttered shrimp on top and add a few slices of jalapeño pepper. Fold them up, pop them in a serving dish and add a few lime wedges for an extra squeeze of flavour. Yum alert! 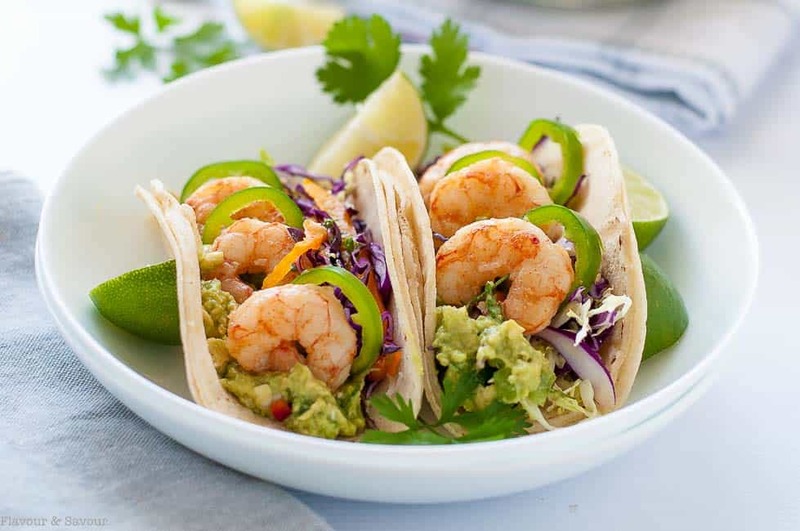 These shrimp tacos are bound to become your new favourite, too. And if you love zesty flavourful shrimp, you’ll also like these 10 Minute Grilled Chimichurri Shrimp Skewers. 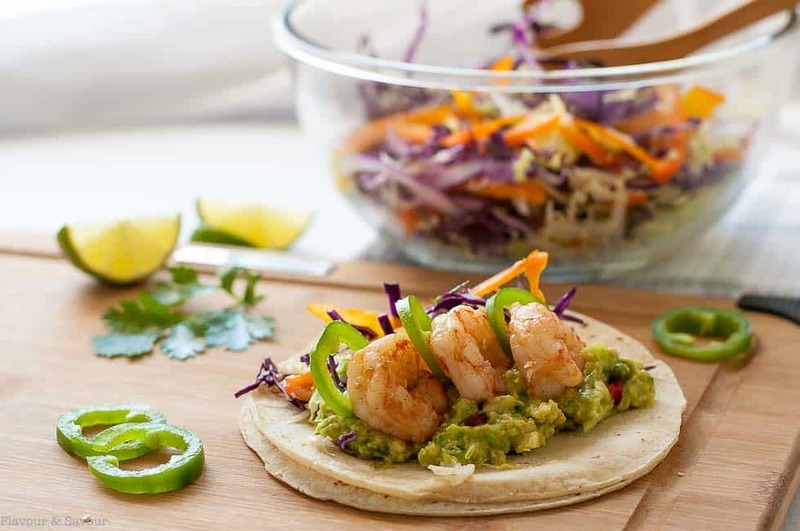 These Shrimp Tacos are loaded with zesty Tomatillo Guacamole and crunchy Cilantro Lime Slaw. They're topped with garlicky buttered shrimp, fresh jalapeño and a squeeze of lime. 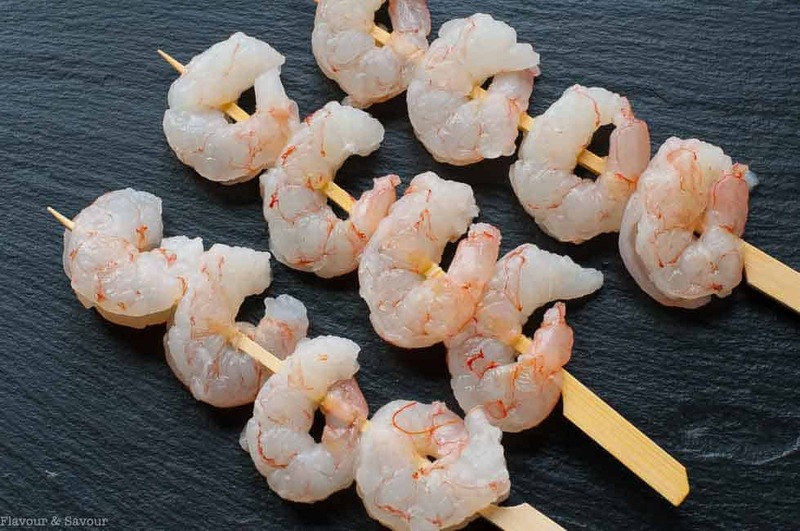 If using bamboo skewers, soak in water for at least an hour before grilling the shrimp. 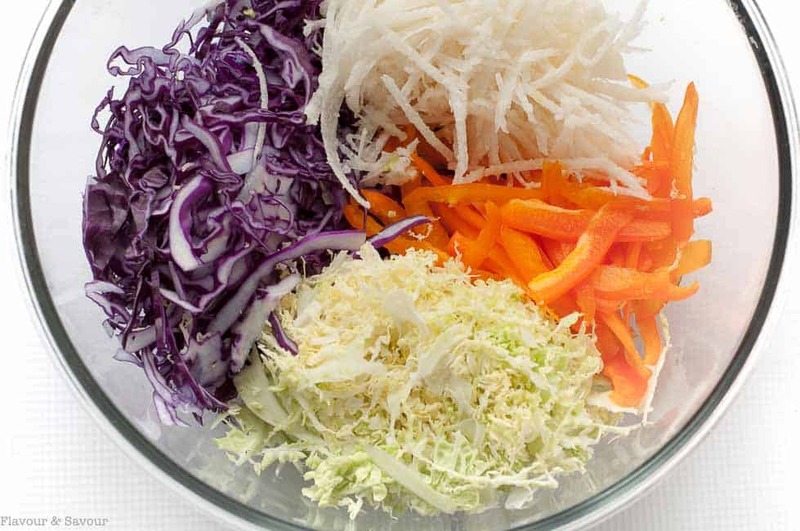 Combine shredded coleslaw vegetables in a large bowl. Whisk Cilantro Lime Dressing ingredients together and toss with shredded vegetables. Mash avocado with a fork and stir in remaining guacamole ingredients. 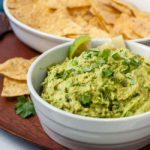 Don't use a food processor, as the guacamole should be chunky. Melt butter, add garlic and sauté until golden. Skewer the shrimp, brush with garlic butter and grill over medium heat, 2 minutes on each side until a nice colour forms. Remove from skewers. Assemble the tacos. Heat the tacos either in the microwave wrapped in a towel or in the oven wrapped in foil. 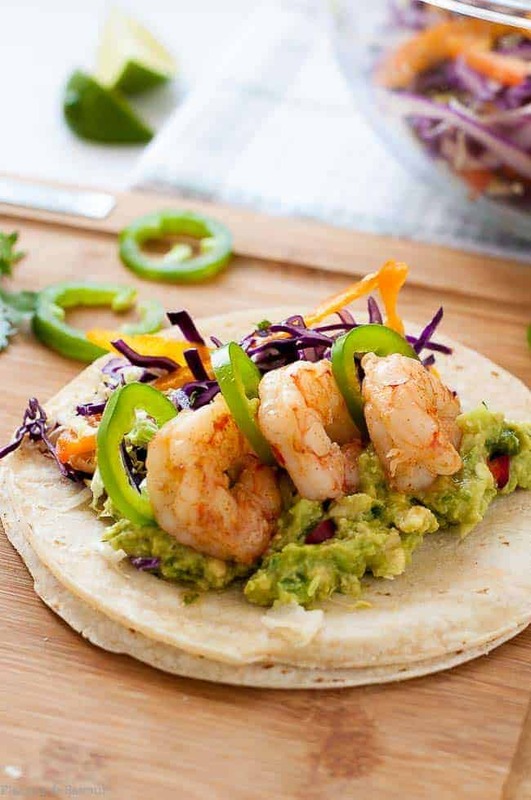 Stack two tortillas together, then add the slaw, the guacamole and top with shrimp. Garnish with jalapeño slices and serve with slices of lime and a napkin! The ingredient amounts for the Cilantro Lime Slaw will make more than you need for the tacos. I like to serve extra on the side. 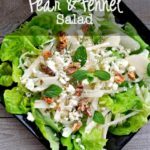 This slaw is also great for lunch the following day. So could I! These have all my favourite flavours! Yum! These shrimp tacos look incredible. Pinning to make next weekend! Thanks! Hope you like them as much as we do! Prawns are my family’s favorite! They would be happy to have this anytime.Lovely recipe. We love prawns, too and NEVER get tired of them! Thanks for commenting! Thanks Bintu! They’re always popular in our home. Oh, so beautiful! These are on my to-do list for sure! Thanks, Jane! I’m sure you’ll like them–so good!